SDP secretary Reijo Paananen at a party council in Hyvinkää on Saturday. Photo – Lehtikuva. 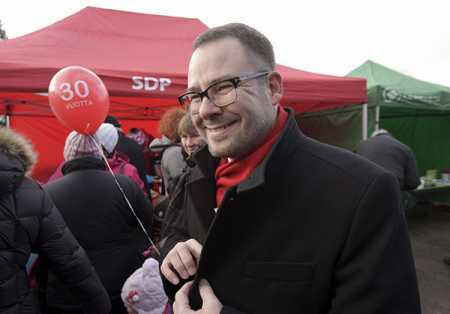 The secretary of the main opposition Suomen Sosialidemokraattinen Puolue (Social Democratic Party of Finland-SDP), Reijo Paananen surprised the SDP national council meeting on Sunday by publicly announcing his availability in the labour market. Paananen informed the council that after the party’s February meeting, he would be available for work and would be happy to receive interesting job offers. Paananen expected that the party council would enquire during the meeting whether he would continue as the party secretary. He has not given a definite answer, but Paananen admitted that he intended to use the meeting for publicity. “Now that this kind of opportunity is available, I’m in favour of it. I’d love to hear a variety of offers,” Paananen said. Paananen stressed that the announcement does not mean that he would not like to continue as the party secretary. “I have done really interesting jobs in my life and I am ready to hear some offers. Of course, this is a really self-satisfied situation and the point is that someone out there would want to hire such a person,” Paananen added.